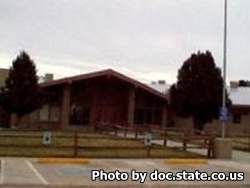 Skyline Correctional Center is located in Canon City Colorado and is part of the East Canon Correctional Complex. Skyline Correctional is on of three minimum security level I institutions within the state. Up to 250 inmates can be housed at any given time at this facility. The educational, vocational, and work opportunities that exist at this institution provide a strong foundation for inmates to gain employment after incarceration. Offenders located at this institution can earn a GED or basic adult education. Inmates can also attend a variety of college courses offered at Adams State College. They may also receive treatment for alcohol and narcotics addiction. Work opportunities within Colorado Correctional Industries include recycling, fish hatchery, dairy farms, canine programs, wildfire team, vineyard and farm work. Visits are on Fridays, Saturdays, and Sundays from 12:45pm-4:30pm. The processing of visitors will occur from 11:15am-2:30pm. If you arrive after 2:30pm you will not be admitted to visitation. Inmates may have up to three visitors at a time.